Turkish music and the prepared piano are not as far apart as one might think (Mozart tried out some Turkish drum effects with paper on the piano strings back in the day). But now Istanbul-based composer/pianist Erdem Helvacioglu has made the connection even more dramatic and sensuous. “Eleven Short Stories” is a set of nearly a dozen atmospheric vignettes for prepared piano, paying homage to some of his favorite film directors: Kim Ki-Duk, David Lynch, Krzysztof Kieslowski, Theodoros Angelopoulos, Jane Campion, Anthony Minghella, Ang Lee, Atom Egoyan, Darren Aronofsky, Alejandro Gonzalez Inarritu and Steven Soderberg. The pieces are not aligned with a director but rather suggest particular scenes through titles such as Shattered Snow Globe, Mist on the Windowpane, or Bench at the Park. The music runs the full gamut and shades of emotions you might expect from imaginative art-film. There’s stark, pensive observation, wariness of impending jeopardy, rooting around in a Samuel Beckett-like Unknowable; all with the potential for horror and the need for hope. The notes from the piano – gamelan-like – plop gently like summer raindrops coloring the pavement, or slashing the jugular vein, as needs be. Close your eyes and it all makes sense. Just as a movie proposes its own cinematic reality, each individual piece has preparations unique to its story and soundworld. The piano strings were strewn and inserted with pencils, erasers, paper, plastic and metal spoons, knives, forks, drumsticks, guitar plectrums and slides, e-bows, metal plates, clapsticks, ear plugs, and paperclips attached to the strings within. Not forgetting a toy train and a 60s fashion magazine. "Eleven Short Stories is an excellent CD, and I would highly recommend it." "...this is some of the most stimulating and provocative music you'll hear." "This is an intriguing album that obliterates genre boundaries and often creates music of quiet beauty." "The sound capture is perfect, the mood is quiet, and the beauty is palpable. Simple, meticulously-designed music." "This album is one of the most rewarding prepared piano releases I have heard in a long time." "Some of his best work yet." "Normally I am not the biggest lover of modern classical music, but for this lovely solo prepared piano I very gladly make an exception." "It's music for a rainy day, a sunny day, a brown study. The suite's titles suggest a series of short stories that make the music a kind of soundtrack for life's experiences. Your life's experiences, if you open yourself up to the music. An excellent diversion that succeeds on a purely musical level as it forwards sound poetry of rich associations." 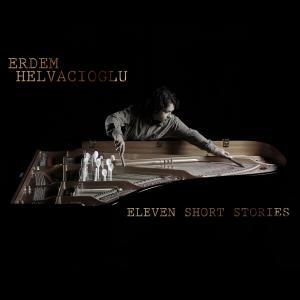 "Turkish composer Erdem Helvacioglu embarks on a fascinating project with this recording. Eleven Short Stories is an engaging release for anyone interested in the sound of the new." "Helvacioglu's approach here makes for an incredibly pleasant aural experience, yet also intrigues and challenges the listener." "Helvacioglu liberates both himself and his listeners from genre confines and preconceived notions."